Doug Turnbull receives a plaque honoring Turnbull Manufacturing’s contribtutions to the Hunting Heritage Trust Auctions from Bob Delfay. 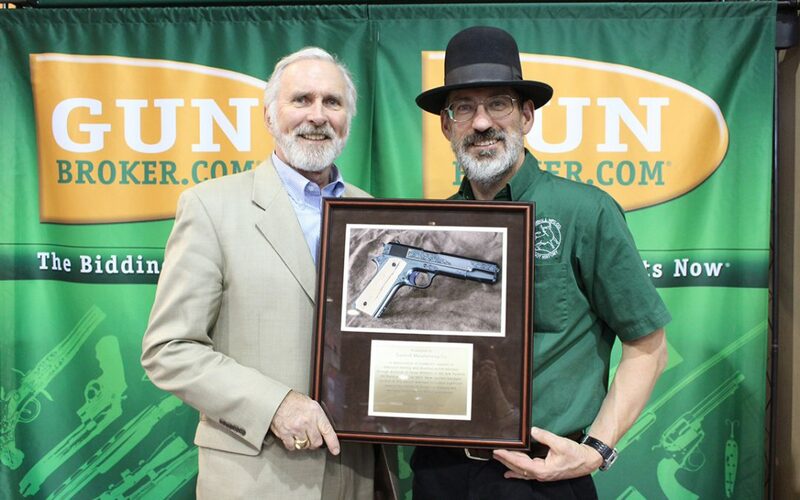 Doug Turnbull, founder and CEO of Turnbull Manufacturing has announced that the first Deluxe Model 1911 Classic pistol – serial number 1911001 – raised over $36,000 at the 2014 SHOT Show auction to raise finds for the all important Hunting Heritage Trust. Working with Bob Delfay from the trust for the second year, the Turnbull pistol was selected as the 2014 SHOT Show Auction handgun. This is the second year that Turnbull has been a large part of the Auction. In 2013, the Auction featured the first production model of the very popular TAR-10 rifle, which is a highly detailed and inlayed rifle built on the AR platform. That gun raised $136,024, yielding a 2 year Auction total of over $172,000 for the Trust, which supports and promotes the American traditions of hunting and the shooting sports. The Turnbull Classic 1911 is modeled on the look and feel of the 1911 pistol as it was manufactured in 1918, which is the classic look that all 1911 shooters feel is the essence of the pistol. The Classic is manufactured using Turnbull’s unique combination of modern materials and safety features and methods that were used when the 1911 was first in production in the last century. The Classic features a forged frame, wide spur magazine, competition level trigger group, hand checkered grips and comes with 2 magazines. The frame is blued using the traditional charcoal bluing method that produces the deep, lustrous blue that 1911 shooters are familiar with as well as a stronger frame overall and carries Doug Turnbull’s inspector’s mark. The model auctioned off at the 36th annual SHOT Show was custom engraved for the Auction featuring scroll engraving and gold inlay. Serial number 1911001 (1911, number 001) indicates that this is the first Turnbull 1911 Classic production model to be completed. Turnbull is known globally for the ability to take even the most damaged collectible gun and return it to its original look, feel and function. They also have new production firearms that incorporate the same quality look and feel as the collectibles they are famous for restoring. Entering their 4th decade, Turnbull Manufacturing has maintained a strong commitment to building firearms the way they used to be built. Founder and CEO Doug Turnbull is best known for his mottled color case hardening which stands out as the most striking and unique. Turnbull offers other reproductions as well as a full array of the finest and most respected restoration services in the shooting trade. Please visit us at www.turnbullmfg.com for more information.